People are always looking for new ways to style their hair. Curling irons offer affordable and easy hair styling options. Are you a fashion lover and a frequent traveler and concern about whether or not your curling iron will work in other country? Power sockets are not similar worldwide, US power sockets are different that of European countries. In this blog post we compiled a list of dual voltage curling irons that is sure to work in anywhere around the world. Before buying any tool, it is important to know exactly what you are buying. Several parts and features, therefore, are provided in the reviews below, so that the buyers who are new would be able to choose wisely according to their needs. Does it come with anything free i.e. glove? What is minimum and maximum temperature? Does it work worldwide i.e. dual voltage support? Without further ado, here is the details review of each curler. This Conair 3/4 inch curling iron is made specially for curls with definition. It provides salon-style curls with the help of 25 heat settings. The heat gets distributed evenly because of the smart technology that is incorporated in the design. The problem of hot spots gets eliminated. With the lowest setting, you can get the best results. There is a Turbo Heat feature if you want faster heating and curling. The dual voltage option allows you to travel with it to any place. The curler automatically shuts off when you keep it aside for a few minutes. The barrel is made of different elements like chromium, steel, nickel, copper which enhance styling. Additional features are the non-slip handle, long cool tip and safety counter rest. This is the cheapest curling wand we reviewed on this page so far. The clamp free curling wand makes it very easy to style all types of curls. This red metallic wand is meant for tousled curls and waves. You can get up-to 400 degrees of temperature with this curling iron. Just wrap the hair around the barrel and the heat does the rest of the job. The tourmaline ceramic barrel is ideal for reducing frizz and producing shiny hair. You can style your hair with this product easily because of the swivel cord and heat-protective glove. You will get a quality product at an affordable price. Want professional hair styling at home? Go for Xtava Twist curling wand. The 1 to 1.5 inch long, round barrel has a tapering tip for loose curls and the wider end can be used for creating curls with definition. It comes with 22 heat settings and a digital display. The ionic ceramic and tourmaline barrel coating for the three barrel sizes ensures even heat distribution and consistent curls. You also get a heat resistant glove and travel case with this hair curler. Universal dual voltage, 360 degree swivel cord and 60 minute auto-shut off are smart features. This easy to use, gorgeous black curling wand is perfect for any kind of hair. This curling iron from Revlon has all that you can ask for. It offers dual voltage, heat resistant barrel cover, auto shut-off options and temperature of up-to 400 Fahrenheit. The three coatings of ceramic on the barrel prevents frizz and heat damage. The Perfect Heat Line that the curler has, provides optimal styling and shiny curls. You can create large curls or simple waves with the 1 1/4 inches long barrel. The curling iron heats up in just 30 seconds so that you can use it even when you are getting late. This Salon curling iron provides professional results with minimum effort and at a reasonable price of under $20. The first thing that you notice about this curling iron is that it is clip-less unlike other curling irons on this list. This is a great feature because it eliminates pulling and breaking of hair. The tapering shape is meant for providing both structured and loose curls. The negative ion technology prevents frizz. It works on all types of hair- long or short, wavy or straight. The curler heats up quickly to a temperature of about 400 degrees Fahrenheit and reduces the time spent on styling to half. This also minimizes the damage inflicted by the heat. The use of ceramic seals the hair cuticle and prevents odor. Dual voltage and travel friendly heat resistant glove are good additions. You can get beautiful and bouncy curls for just around $20. If you are looking for a curling iron which can become your travelling companion, then this is the right choice. It works best on thick hair and creates wonderful loose curls. Finding dual voltage in curling irons is difficult but this one operates at 110/120 volts as well as at 220/240 volts. There are 30 heat settings to ensure amazing results for all types of hair. The best part about it is the ceramic coated barrel which heats up quickly and distributes heat evenly. Curls last longer and you get rid of frizzy hair. It is very easy to clean and is safe for your hair as it automatically shuts off after 10 minutes. Though a little large in size, this product is literally a coup at around $20. This curling wand heats up in 60 seconds. You can get a heat of 410 degrees to style your hair the way you like. The 360 degree rotating cord is a long one and ensures easy styling. There are two curl clips and a heat resistant glove inside the box. This too has a ceramic coated barrel and has a cool tip. The dual voltage makes it easy to use anywhere. The curler automatically shuts off after 30 minutes. The only problem is the long handle which makes it difficult to pack. Curls last for a whole day and you can get a head of bouncy curls in fifteen minutes. The thermally insulated wand helps to avoid scalding. Anjou curler is slightly higher price compare to the above curlers but its worth it gives you optimal results. Despite being just an inch long, the ceramic barrel provides fast heating and even heat. The width of the barrel is on a thicker side which makes loose curls and waves very easy to obtain. The travel pouch and universal dual voltage are useful for travelling purposes. The high heat setting is very convenient for getting quick and stylish curls. The mini barrel works well on shorter hair but is a little difficult to operate on longer or thicker hair. A good feature is the clamp which does not stick out at an odd angle. It only juts out after you press the release. The $20 price tag may seem a little high for a mini curling iron but it does deliver results. The ceramic barrel is the best part about this curling iron. It provides even heat to any length of hair and eliminates hot spots. The medium width of the barrel is good for tight as well as loose curls. You can get rid of frizz and create any hair style at home with this curling wand. The 1.5 inches barrel covers a long length of hair at one go. The temperature remains consistent up-to 400 degree Fahrenheit. With the option of 25 heat settings, you can get smooth and silky curls in no time. The product comes with a year’s warranty and dual voltage. You can achieve quick and professional styling by spending $30 on this curling iron. This mini curler has a 1/3 to 3/4 inch barrel which is perfect for getting smooth ringlets that look natural. It is travel friendly as it is lightweight and comes with dual voltage technology. The barrel made of tourmaline provides heat up-to 400 degrees. It heats up and cools down quickly which is a time saving feature. The clip-less design makes it very easy to just wrap the hair around the curler and style it in seconds. It makes use of negative ion technology which adds long-lasting shine to your curls. What is missing is the auto shut off option and the temperature regulator. However, it works perfectly on all hair types. Its durability is amazing and it gives volume to the hair at just $19.99. This is different than the other hair curlers on the list because it has a flat iron for straightening purposes. The barrel uses tourmaline ceramic technology which helps in retaining moisture and protects hair from damage. The cool tip is provided to prevent scalding. It has various heat settings up-to 446 degrees Fahrenheit to achieve the best home-styling results. Dual voltage allows it to be taken on trips. Using the front half of the curling iron produces a better styling effect. You get this curler plus straightener for just around $30. 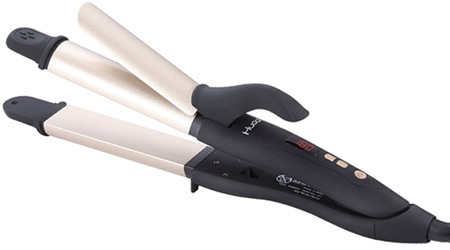 If you are looking for dual voltage flat irons check these out here. It is important that the user knows how to adjust the different settings and features of each curling iron before using it especially the people who are new to using these styling tools. Most of the tools you buy would come with a user manual that will help the users not only assemble the parts of the iron but also come with the instructions that prove to be quite useful. So don’t forgot to keep these dual voltage curlers with you on your next trip to other counties and save yourself from expensive trips to the salon.